UNA PICCOLA SOMMA CHE DIRA’ QUANTO E’ GRANDE IL VOSTRO IMPEGNO DA CONDIVIDERE CON NOI PER SALVAGUARDARE LA NOSTRA ITALIA E IL NOSTRO PIANETA. TUTELARE L’AMBIENTE VUOL DIRE PENSARE A SOLUZIONI PER LA SALUTE,PER IL LAVORO,PER LA CULTURA,PER GLI ANIMALI, PER LA VITA DELLA CITTA’ CHE ABBIAMO SEMPRE PROPOSTO A CHI GOVERNA MA INASCOLTATE PERCHE RISOLUTIVE ANCHE PER I COSTI FINANZIARI SOSTENIBILI. 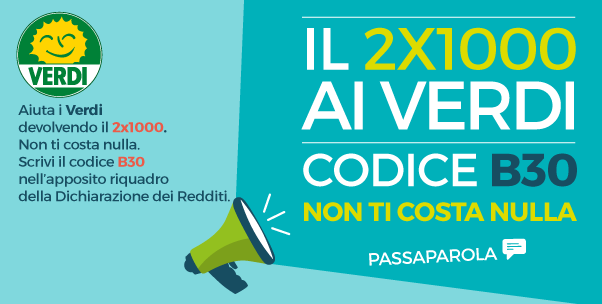 PER I GIOVANI L’ISCRIZIONE COSTA ANCHE MENO!!!! !